DRESSED in a flamboyant cowboy-themed outfit, Daniel Ricciardo was bucked out of the US Grand Prix as his rodeo of an F1 season continued. And this time the normally cool, calm and collected Aussie let his frustration explode, punching a hole in a wall after his fifth premature exit in 10 races. A brief collision with Sebastian Vettel during the first lap didn't appear to hurt the West Australian as he managed to hold on to fourth place. It was shaping up to be a satisfying finish ahead of teammate Max Verstappen, who started in 18th after a qualifying blowout. But we should have known better than that by now. Ricciardo was sent spiralling out of the race after another mechanical failure saw his Red Bull grind to a halt in the ninth lap. The 29-year-old raised his hands in the air in rage at his seventh DNF of the year as the all-too-familiar trackside motorbike arrived to bring him back to the sheds. 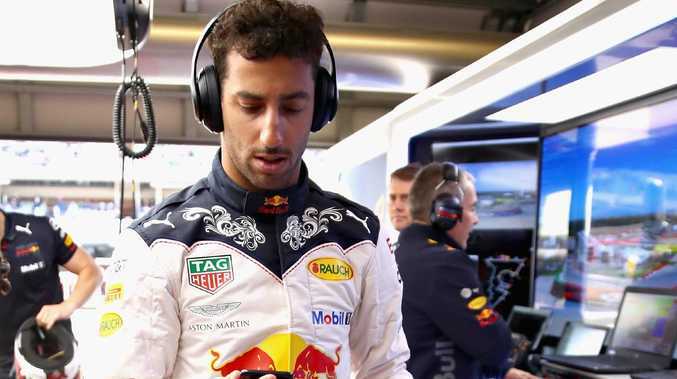 Ricciardo, widely regarded as the nicest bloke on the grid, rarely lets his frustration show but it was clear the latest mechanical slip up was the final straw for the embattled Red Bull star. 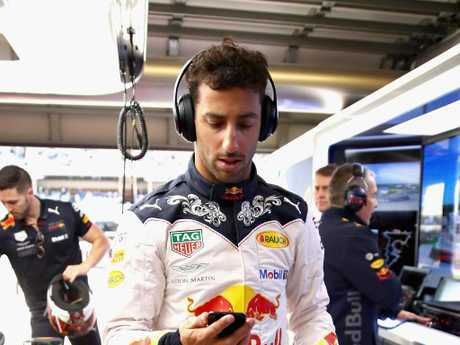 Team boss Christian Horner revealed Ricciardo "put his fist through a wall" after returning to the Red Bull shed. "It was a crying shame for Daniel and I feel so sorry for him," Horner told Sky after the race, which saw Verstappen claim second place ahead of Lewis Hamilton. "It looks like the identical power issue from Bahrain. He was driving a strong race, it's so frustrating for him. I hope no more penalties, we should have enough components for him not to." Ricciardo's shock decision to join Renault rocked the Formula 1 world in August and sent rumours flying over his relationship with Red Bull. Horner took an interesting jab at Ricciardo's future employer, who currently supply Red Bull with their engines. Daniel Ricciardo has understandably lost his patience this season. "I'm sure he will have a word with his future employers about this because it's so frustrating losing him from races," he said. "He doesn't blame the team in any way, he knows we are doing everything we can, it's just one of those things." A host of Ricciardo fans believe the Austrian-based team has sided with the 21-year-old Verstappen - tipped to become the youngest ever F1 champion after taking the sport by storm - behind the scenes. But Horner remained adamant both stars, equal in the eyes of Red Bull bosses, can be in with a fighting chance in Mexico next weekend. "I think both guys can be strong in Mexico. We (Verstappen) won it well last year, a really dominant win for us," Horner continued. "At that altitude the engines can't breathe and it brings it all closer together, and that gives us a chance. "We're lacking that horsepower, and this will give us a fairer chance on a Saturday, and you can see we've got a good race car." Verstappen held off Lewis Hamilton in a stunning finish to the US Grand Prix, which saw the Englishman fight furiously for second place. Hamilton needed to claim second with rival Sebastian Vettel finishing fifth to wrap up his fifth championship on Monday morning (AEDT). But in the end it didn't matter as Vettel made a last minute charge on the straight to overtake Valtteri Bottas for fourth, sending the championship battle into next week's visit to Mexico. Ricciardo, meanwhile, has three races left before his rollercoaster relationship with the Bulls comes to a close.